The Green Oak Carpentry Company are delighted to have been commissioned by the National Trust to re-build the original William Halfpenny Chinese Bridge built for the 6th Earl of Coventry in 1751. Shortly after completion the house and garden underwent further extensive construction works by ‘Capability’ Brown and Robert Adam. 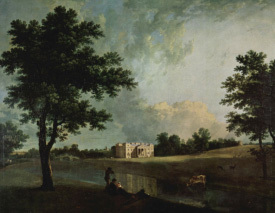 The bridge can just be seen bottom left in this painting by Richard Wilson in 1758. Croome Court was the family seat of the Coventry family from the mid 17th century until 1949. Croome passed into National Trust management in 1996 and has since that time undergone extensive renovation, still in progress to the present day. The drawing below shows Halfpenny’s original design for the bridge. In the mid seventeenth century ‘Chinoiserie’ was at the height of its popularity, vying with ‘Gothic Revival’ for ascendancy. Reconstruction of the bridge is well underway with completed and signed off drawings. Carpentry will commence in March 2015 and it is anticipated that the new structure will be open to the public in June 2015. Greenheart is being used for the pylons which stand in the moat, hence durability is critical. Greenheart is traditionally used for sea wall defences and groins where toughness and durability are important. The remainder of the structure is prime fresh sawn oak, all jointed with draw-bored mortice and tenon joints. The whole bridge structure will be painted in a traditional oil bound distemper to match the original. See below our 3D model of the bridge.